OKLAHOMA CITY - The Oklahoma City Dodgers will honor the service and dedication of local military members and their families Friday at Chickasaw Bricktown Ballpark on Hometown Heroes Military Celebration Night, presented by RSM and Folds of Honor. 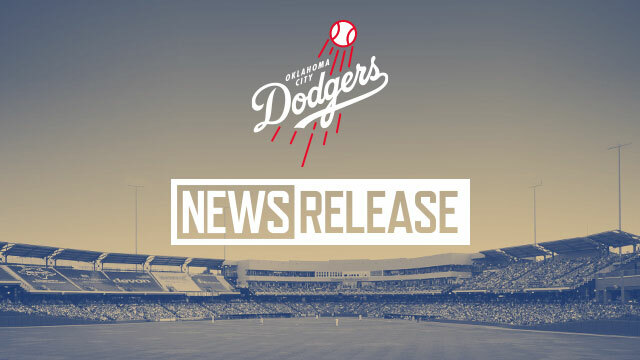 The Dodgers play the Omaha Storm Chasers at 7:05 p.m. Friday, and special festivities will be held throughout the evening, culminating with postgame fireworks presented by Francis Tuttle. "Our second Hometown Heroes Military Celebration Night of the season provides us with the opportunity to show our local service men, women and their families how grateful the Oklahoma City community is for their service," said OKC Dodgers President/General Manager Michael Byrnes. "These nights of recognition in June and August allow us to honor the sacrifices and commitments made by these devoted individuals and offer our appreciation first-hand." A swearing-in ceremony of new Air Force recruits will take place on the field prior to the game. Folds of Honor Major Ed Pulido and Colonel Gavin Marks, Vice Commander, 552 Air Control Wing from Tinker Air Force Base, will throw out ceremonial first pitches. Chief Master Sergeant Mark Hurst, Command Chief, 552 Air Control Wing will deliver the lineup card. The Tinker Air Force Base Honor Guard will present the colors during the singing of the national anthem performed by Senior Airman Froy Lockhoff-Taylor, 552 Maintenance Squadron, Tinker Air Force Base. Lockhoff-Taylor will also perform "God Bless America" during the game. Representatives from RSM and Folds of Honor, each branch of the military as well as other military and veteran organizations will be available on the concourse throughout the evening to share information with fans. The Dodgers open their final homestand of the 2017 regular season at 7:05 p.m. Thursday against the Omaha Storm Chasers at Chickasaw Bricktown Ballpark on a $2 Thursday featuring $2 soda, water and beer from a line of Pepsi and Budweiser products. The series against Omaha continues at 7:05 p.m. Friday with Hometown Heroes Military Celebration Night presented by RSM and Folds of Honor and postgame fireworks presented by Francis Tuttle. On Saturday, gates open at 6 p.m. and the first 1,000 fans will receive a Cody Bellinger T-shirt. The OKC Disc Dogs will perform throughout the 7:05 p.m. game and fans will also have the opportunity to bid on game-used, game-worn autographed OKC Dodgers memorabilia during the Clubhouse Collectibles silent auction presented by The Oklahoman. Sunday's 6:05 p.m. game falls on a Chaparral Energy Family Sunday. The homestand continues with a four-game series against the New Orleans Baby Cakes beginning at 7:05 p.m. Monday. The regular season concludes at 7:05 p.m. Thursday, Aug. 31 against New Orleans on a $2 Thursday and special Throwback Thursday. Oklahoma City will take the field in Oklahoma City 89ers gear and the players' and coaches' throwback jerseys will be auctioned off to benefit the OKC Dodgers Baseball Foundation.